Review | An SUV is "not done" anymore. But what's not acceptable isn't less attractive. On the contrary! The mighty feeling and rugged looks of an SUV are still very desirable to many. Therefore Mercedes now introduces a compact SUV. According to Mercedes this smallest off-roader the brand has to offer is just as invincible as the larger models. Can Mercedes pack the sensation of the big SUVs in the compact GLK? The exterior quickly shows what it is all about with the GLK. This isn't the next wannabe SUV, but a car that provokes and says everything is possible. The sharp edges are derived from the Mercedes G-Class and also give this small GLK an invincible appearance. Inside the car everything is square and "edgy" as well, by which the GLK clearly distinguishes itself from the masses. The driver sits up straight and sees the world trough a relatively small and upright windscreen. The tall bonnet is always in sight, adding to the mighty feeling. The space in the front of the GLK is fine. On the back seat, room is no more than average for a car this size. The luggage compartment measures 450 litres, a little less than average. To make clear that this smallest SUV is also a real Mercedes, all features from the larger models are available on the GLK. For example the tail gate can be operated electrically. To make parking easier a rear view camera can be installed. When the GLK is first launched, two six-cylinder engines will be available. Smaller power units will be added later. A seven speed automatic gearbox (with the possibility to shift sequentially) comes as standard. For this road test both the GLK 350 (3,5 litres six cylinder petrol engine) and 320 CDI (3,0 litres six cylinder diesel) were driven. Both change this modest looking SUV into a real beast. Both engines are very eager to perform and downright fast. The petrol version is the more aggressive of the two. A gentle tap on the throttle is enough to launch the car in one powerful move. After experiencing this once, the temptation is almost irresistible to utilise the full power whenever possible. Time and time again a roaring, deep sound (even with the diesel engine!) adds to the excitement. The diesel is just as provoking, but especially excels at high speeds on the Autobahn. When driven slowly the GLK is very quiet; noises from the wind and mechanical parts are limited to an absolute minimum. At slow paces gas mileage is very modest for a car this size. 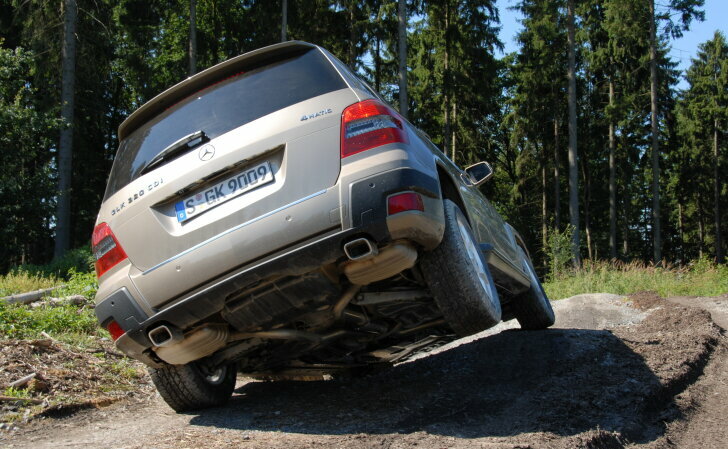 Thanks to "Agility Control" the GLK can change its suspension to adapt to every situation. The GLK is supposed to be dynamic and direct on highways and offer extra comfort in city traffic. In reality the effect of this system is disappointing. The GLK has firm suspension, but still tilts over when cornering. In quick turns or during an emergency stop it is evident that this is a very heavy car, smart electronics cannot change that fact. No matter how well the engine performs, this is still an off-roader (although from a technical point of view the GLK is based on the C-Class). Mercedes' ESP (Electronic Stability Programmes) guaranties maximum safety in every situation. However this system interferes earlier and more frequently than with conventional cars. On bad roads and at high speeds the GLK can even start to bounce making the ESP continuously perform little corrections. Especially for passengers this can be very unpleasant or even nauseating. The optional sports-package lowers the GLK by 20 mm supposedly improving road holding. But in fact the difference with the standard suspension is small. For many the sleeker and streamlined looks of the sports-version will be attractive though. For this road test the standard version was mainly used. Every GLK is fitted with permanent four wheel drive and a system that prevents most of the power going to the wheel with the least resistance. When going off-road the wheel with the lowest resistance can be up in the air or hopelessly spinning in loose sand (not providing any traction). By sending most power to the wheel with the most resistance, the GLK even manages to pull away from situations where only one wheel still grips. Altough the GLK is not fitted with pure off-road technology like "low gearing" or "diff locks", a similar effect is obtained by the electronics in the optional "off-road" package. With this extra feature the ESP (Electronic Stability Programme) and ABS (Anti lock Brake System) are adopted to off-road driving. In the special off-road modus the throttle responds much less direct. This makes it easier to keep the car exactly between slip-and-grip, as necessary for off-road driving. Also the computer makes off-road driving very easy. To climb a steep hill it is enough to floor the throttle, the computer takes care of the rest. For descending it is enough to activate "Descent Control", select the desired speed and let go of the brake. 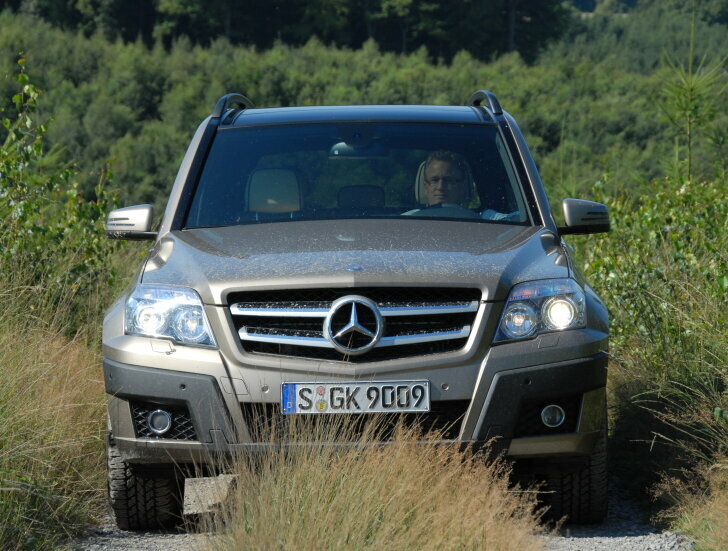 After that the GLK descends slowly and perfectly controlled, from hills as steep as 70%! In real life these systems work very well. The GLK plows, thanks to the computer, bravely up the most improbable slopes. The computer saves the driver from situations that would normally require some serious off-road experience and know-how. Also the car gives good feed back, making off-roading even easier / nicer. The underbody protection can withstand very heavy beatings and even when the going gets too tough, the GLK continues through every terrain. This is no softy, this is a sharp off-roader that really performs! Does Mercedes manage to pack the sensation of the big SUVs in a compact shape? Yes! The sharp edges of the GLK make the car just as impressive looking as the bigger models. The interior is a good blend between those same sharp edges and all the luxury that is expected from a modern SUV. Thereby the GLK gives the driver the special feeling of driving a powerful, mighty vehicle. This feeling is enhanced by the driving characteristics. 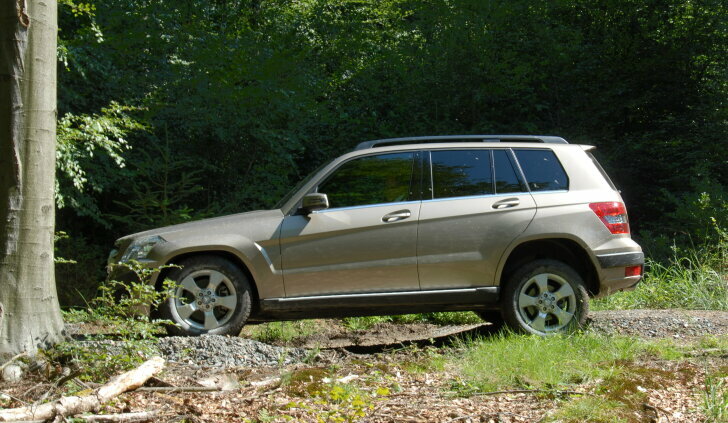 Despite "Agility Control" the GLK always behaves like an off-roader, not like a normal car. That means tilting over in corners. The GLK drives well, but this certainly isn't the best driving car in its class. When going off-road the GLK does really distinguish itself from the competition. This is where the GLK feels right at home and matches the impressive looks with impressive performance.